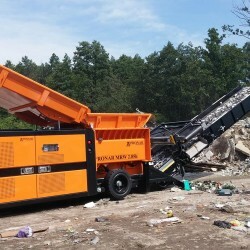 Pronar MRW 2.85h – New member of our recycling family - Pronar Sp. z o.o. 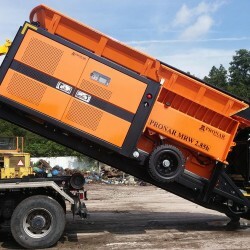 Pronar MRW slow-speed shredder range has been expanded by the newest variant MRW 2.85h designed for aggregation with hooklifts. In most cases waste storage and treatment facilities are stationary installations. MRW 2.85h was created to meet their needs. 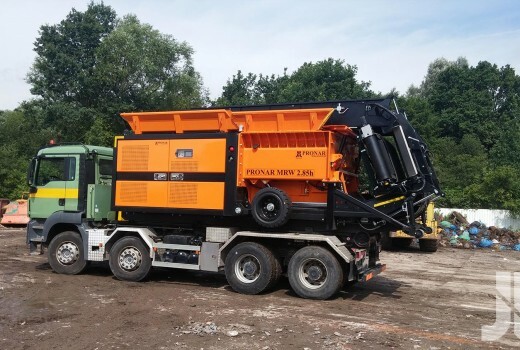 In situations where the shredder rarely changes its workplace and the company has vehicles with a platform for transporting hooked containers, it is possible to dispense an autonomous chassis – axle or tracked type. Eliminating these components has reduced the purchase cost of the machine itself , and in the longer term, it contributes to additional cost savings, where tires, brake, pneumatic, electric and hydraulic systems are eliminated. Long distance transport is possible on trailers and trucks equipped with a hook system. 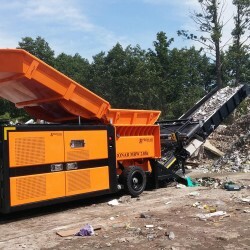 Moving on the landfill is facilitated thanks to hydraulically lowered wheels and a universal drawbar. 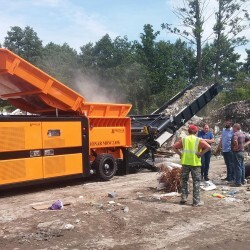 It takes only minutes to prepare the shredder to change its position. The new variant possesses the same shredding performance and quality like the tracked and wheeled variants offered to date. Loading height of 2.5m and unloading between 2.5 and 4.8m allow the machine to be used in smaller and more compact warehouses. An additional novelty is the optional electric motor, which further lowers running costs and eliminates all inspections and materials that would need to be taken into consideration when operating an internal combustion engine.